Toilet risers give you a helping hand to get back to a standing position by allowing you to raise and lower the seat to your own height requirements. Yorkshire Care Equipment’s range are ideal for those who struggle to get up after using the loo, and they can be used over your existing toilet. We also stock Easi-Seat risers for clients with complex disabilities. The Easi-Seat toilet riser is a unique product, with a vertical rise action. Key to the design is the way that this product can be tailor-made, helping solve problems which can’t be addressed with standard toilet risers. 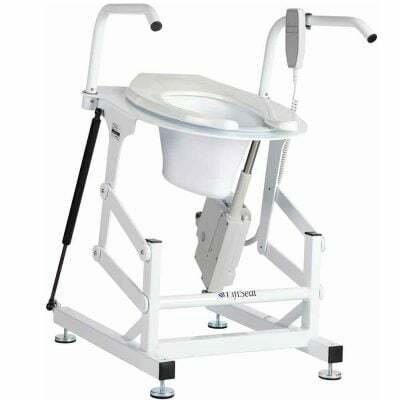 The Home LiftSeat delivers safe, reliable and comfortable assistance to people who battle conditions that compromise their strength and need assistance getting on and off the toilet. Mimicking the user’s usual standing movement, the Solo toilet lift assists the person from a seated to a standing position at the touch of a button.